Vegans rejoice, because scientists have discovered and perfected a seaweed that tastes like bacon and it will change the face of vegan cuisine for good. People love bacon, with their eggs in the morning, in hamburgers, on pizza and pretty much anything you can think of. But while bacon may taste amazing, having sizable amounts of it will not keep you healthy. Well, now there is hope, because a team of researchers from Oregon State University have found a plant, a seaweed strain out of all things, that has that bacon taste when it’s fried, grilled or smoked. Actually, the texture might make it the perfect thing to be the vegan bacon. This would not be the first time when seaweed replaces meat in vegan dishes. The seaweed strains who bear that sea flavor are particularly good for replacing fish in meat-free dishes. And while dulse, this new bacon seaweed, might be a hit among vegans and vegetarians, it stands to become quite popular among those people whose doctor advised to stop eating the real actual crispy pork delight. Like Sweet’n Low and Coke Light, it will not be as tasty as the original, but it will make life without it more bearable. Furthermore, a salad that tastes like bacon might make non-meat dishes more attractive for the insatiable carnivores out there who are struggling to eat their greens. Dulse is actually not a newly discovered food, as the seaweed is a wild species that grows along the coastline of the Pacific and the Atlantic. It is a red seaweed strain and it is a crunchy version of red lettuce in appearance. It’s been used in dry form as an ingredient in certain foods, but it has not yet received the attention it is worthy of. Chris Langdon is a professor at the Fisheries and Wildlife Department at OSU and he discovered the amazing seaweed as part of an entirely different project. Initially, it was being used as abalone feed and Langdon was working on improving its quality. Since the results were absolutely outstanding, he thought that it might actually be fit for human consumption. He’s come a long way since then, because dulse is now a very important project for OSU and actually for the entire state of Oregon, that would be the first ever American state to produce such marvelous food. 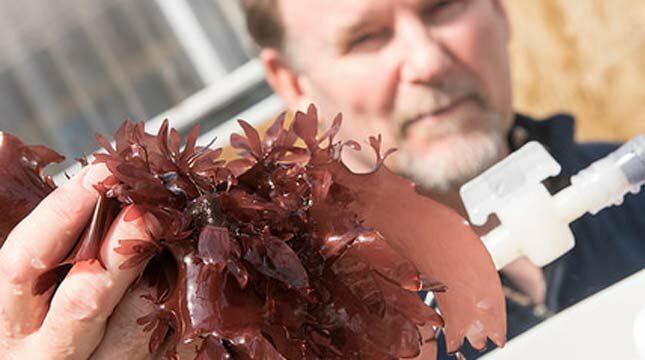 Chris Langdon has developed a perfected strain of dulse, that grows faster and that is richer in nutrients and he has patented the amazing discovery. OSU’s Faculty of Business Chuck Toombs stumbled upon Chris Langdon’s invention and he saw tremendous potential in it and so he quickly presented the entire concept to OSU’s Food Innovation Center. Naturally, they loved it and they intend to make dulse a household name in no time. The plan for factory production is already in place and they even have a working plant at the moment. They also brought in a chef, Jason Ball from California, who is an expert in cooking seaweed as he has researched this type of cuisine at the University of Copenhagen. If you can believe it, the fact that it tastes like bacon is actually not the most interesting fact about dulse. The wondrous seaweed is actually a super-food, because it packed full of nutrients. It is 16% protein in its dried form and that will be extremely helpful to vegans and vegetarians. And it is also an amazing antioxidant and it is filled with vitamins and minerals. The future is looking good for OSU’s dulse and soon enough we will all want to try out the delicious dishes that it will come in. And unlike bacon, you can have as much of it as you want and you will actually be healthier for it. Nepenthes hemsleyana has long pitchers and not too much fluid and it does not release insect attractants. Compared to other species of such carnivorous plants it ingests seven times fewer insects. In a study published in the The Why researchers have explained how a species of pitcher plant communicates with bats in order to feed. 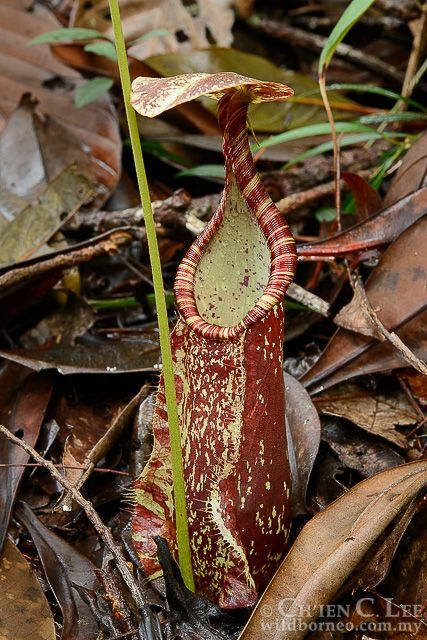 Researchers from Ernst-Moritz-Arndt-University of Greifswald (Germany) have found out that Nepenthes hemsleyana, a species of pitcher plant, does not only rely on its predatory skills, but it also attracts bats and feeds with their feces. Pitcher plants can be found in Borneo, South East Asia and they are well-known for attracting insects into their pitcher. The small creatures which the plants attract die in the liquid which the pitcher contains. Afterwards the plant uses its digestive enzymes and obtains the nitrogen needed for feeding. However researchers observed that Nepenthes hemsleyana has long pitchers and not too much fluid and it does not release insect attractants. Compared to other species of such carnivorous plants it ingests seven times fewer insects. Instead the researchers have observed that Nepenthes hemsleyana has a mutually beneficial relationship with the Hardwicke’s woolly bat or Kerivoula hardwickii. The bat finds shelter inside the plants’ pitcher. Whole families of bats were observed resting inside this flower. So Nepenthes hemsleyana does not use its huge pitcher to catch insect, but it is instead a perfect home for bats. In exchange the bats defecate inside the plant and the nutrients for the feces represent valuable food for the plant enabling it to survive. The researchers were in fact conducting a study on bats when they took notice of this unusual relationship. They assumed that the plant must send some sort of message which the bat can understand because it translates into echolocation language. In order to check their theory the researchers used a an artificial bat which was able to record the ultrasounds signals emitted by the plant and also send ultrasound signals of its own. The findings revealed that the plants are provided with sonar-like parts which attract the bat and the two of them are able to communicate so the bat can find the way to the plant. In addition the roosting sport which the plants offer is so confortable for the bats that they defecate inside the plant. This is not the first time such a behavior was observed in plants. Flower with similar behavior can be seen in South America. They must attract the bats because they are the ones that pollinate the plants. In order to attract the animals they turn their flowers into sonar dishes. Plutonium has an unstable nucleus which allows fission. That is why it is highly used for nuclear weapons and nuclear fuels. Scientists have suspected for a long time that plutonium has magnetism, but they were not able to prove it so far. Now two national laboratories from the Department of Energy have managed to confirm that plutonium is not devoid of magnetism. Plutonium, which was produced for the first time in 1940, has an unstable nucleus which allows fission. That is why polonium is highly used for nuclear weapons and nuclear fuels. Even though its unstable nucleus is a very well-known fact, not the same thing can be said about the electronic cloud which surrounds the nucleus. The electric cloud is also unstable and all these combined make plutonium one of the most complex elements in the periodic table. The two laboratories from the Department of Energy (Oak Ridge and Los Alamos) have observed for the first time the fluctuating magnetism which plutonium has. They were able to do this using a technique called neuron scattering. The paper was published in the journal Science Advances. Plutonium is not devoid of magnetism, but its magnetism has a constant state of flux and that is why it is difficult to detect. Measuring neutrons the scientists were able to determine that fluctuations had a distinct number of electrons in the outer valence shell of the metal. And these fluctuations could clarify why plutonium is not magnetic. Since the sticking power of magnets is drawn from unpaired electrons plutonium’s electrons keep changing unpaired electron cannot line up in a magnetic field. The lead author of the study, Marc Janoschek from the Los Alamos National Laboratory, explained that the electrons around the nucleus can arrange themselves around the plutonium ion and consequently produce magnetism, but other times they delocalize themselves from the ion and there is no magnetism. Janoschek explained that this is phenomenon is known as quantum mechanical superposition. This valuable discovery could be applied in the fields of computers, materials and energy. The researchers could employ the mathematical technique used in this study to predict the behavior of other materials. Queensland cone snail venom could be used for cancer treatment and pain management, as it is rich in new molecules with great potential for medicine. The Queensland cone snail is found in Australia and it is definitely unlike any other snail you might have ever heard about before. It is definitely not the harmless creature that you might be thinking of, but quite the skilled killer. The six-inch snail has a very smooth hunting technique, because it first stings its prey with an extremely powerful painkiller and only afterwords it stings it with a very potent venom. A cone snail bite could actually prove to be deadly even to humans, so fish do not stand a chance in the face of this vicious killer. What is absolutely amazing about the cone snail is that it can stay hidden under the sand at the bottom of the sea and use an air tube to breathe while waiting for its prey to pass by. When the snail feels that fish is near, it can use a specialized tube to sting the fish, thus delivering the painkiller and the venom. In a matter of moments, the fish is paralyzed and then the snail will engulf it whole and then remain hidden as it feasts on prey. A team of researchers form the University of Queensland in Australia, led by Professor Paul Alewood have decided to look closer at the chemicals that Conus episcopatus, the cone snail, uses in its hunt in order to identify the uses they might have in modern medicine. And it seems that the substances that this small killer uses have the potential to enrich the arsenal of a great many fields, as the painkillers that the cone snail uses to essentially anesthetize its prey are much more powerful than morphine and its venom includes a wide range of peptides that could be used to kill off certain types of cancer. He also said that these new painkiller molecules could give way to the development of new medication that could be employed in treating severe pain caused by damage to the nerves or diabetes. Furthermore, it seems that the molecule pallet that they have discovered could even be effective in cancer treatment. This study is only the initial stage of the development of such drugs, but it has provided valuable information regarding a new source for new generation medication. The venom of other species of animals might be researched using the new techniques employed by the University of Queensland, so that in the future even more new molecules could be discovered. Panda’s main source of food, bamboo, has a very little nutritional value and this is the reason why the bears have to eat between 10 to 40 kg in order to satisfy their energy needs. According to a recent study conducted by researchers in China pandas have a low metabolism. Scientists have long wondered how pandas whose bodies are equipped to eat meat can survive eating only low-nutrient food such as bamboo. It seems that they have now found the answer. The paper was published in the journal Science. The research team at the Chinese Academy of Sciences’ Institute of Zoology has shown that giant pandas have a very low DEE (daily energy expenditure). The team was led by Dr. Yonggang Nie. The researchers found out that the daily energy expenditure of the pandas was almost 38 percent of the daily energy expenditure of other animals with similar sizes. Panda’s main source of food, bamboo, has a very little nutritional value and this is the reason why the bears have to eat between 10 to 40 kg in order to satisfy their energy needs. It seems that the answer to this is the low energy demand. For the study the researchers measured the metabolic rate of both wild and captive pandas. The team studied eight animals in total: three wild pandas and five captive ones. Researchers used GPS loggers which were attached to the animals. This enabled them to find out that pandas rest for more than half of the day and when they move they make 20 meter a hour. Finding out that the DEE of the panda was 38 percent of a mammal with the same weight indicates that for example a 90-kg bear expends less than half of the energy of a human who has 90 kg as well. The researchers also noted that the DEE of the panda bears is noticeably lower than the one of koalas and closer to sloths’ DEE. The issue with having such a low metabolism is the fact that the bears have a difficult time keeping warm. The researchers also used a thermal camera to measure the surface temperature of the animals. They discovered that even though the thick fur of the pandas traps the inside body heat, but it is however much lower than other animals that what black and white fur such as Dalmatian dogs or zebras. The invention of driverless taxis can highly prevent the environment’s deterioration. Scientists say that this might be possible in the years to come. 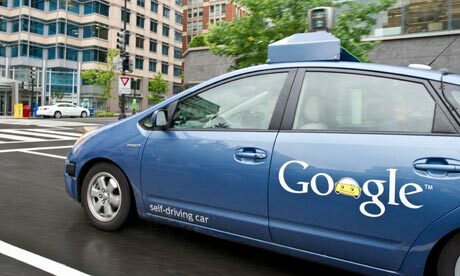 Besides being good for reducing accident rates, self-driving cars could reduce greenhouse gases emission as well. A research published by Berkley Lab indicates that replacing the transportation grid to self-driving taxis could reduce greenhouse gases emission by up to 90 percent before 2030. Nowadays traffic and pollution are one of the most important threats for the environment. Besides this as population grows more and more taxis are functioning in both urban and rural areas in order to satisfy the needs of the population. The invention of driverless taxis can highly prevent the environment’s deterioration according to the study published in the journal Nature Climate Change. Scientists say that this might be possible in the years to come. The clean EV powerplants and the change from privately-owned cars will play an essential role. Right-sizing trips will also make the journey possible by ensuring that the size of the vehicle matches with the number of the passengers. For self-driving taxis to replace normal ones the infrastructure should be completely changed in only 15 years. This could happen when autonomous technologies and EV will get started on condition that everyone cooperates. However this means that many professional drivers will lose their jobs. The researchers involved in the study explained that even a modest switch could have a noticeable impact on the environment. If driverless taxis were to represent 5 percent of the estimated car sales in 2030 they would cut greenhouse gas emissions by up to 2.4 million tons every year. 5 percent is the equivalent of 800.000 prototypes. The data collected by the researchers indicates that if self-driving cars will replace normal cars the emission of greenhouse gas will be reduced with at least 68 percent and it could reach even 82 percent. In addition Jeffrey Greenblatt explained that in the US when people order a taxi most of the customers use a car for a person or two. Introducing smaller cars to fit with the number of customers would highly protect the environment since smaller cars also consume less gas. According to Greenblatt the research team will conduct further investigations and look at vehicle designs and battery choices which would better fit the public. Until then taking the advantages presented in the paper the researchers are very convinced that self-driving cars will highly contribute to the reduction of greenhouse gas emissions. The researchers used a high-resolution X-ray imaging and created a 3D model of the Old World monkey’s brain. Scientists have discovered that the brain of the Old World monkey that lived about 15 million years ago was more complex than previously thought inn spite of its small size. The research was published in the journal Nature and it was conducted by researchers from the Max Planck Institute for Evolutionary Anthropology and Duke University. Also known as Victoriapithecus, the ancient Old World monkey was a family of primates which macaques and baboons were part of. The skull was unearthed in Kenya (Lake Victoria) in 1997. Researchers say that the brain of the monkey was small but well defined and moreover it was more complex than the brain of its descendants. The researchers used a high-resolution X-ray imaging and created a 3D model of the Old World monkey’s brain. They discovered that its brain was about half the size of the brain of monkeys nowadays. However it had an unexpected level of complexity indicated by the large number of folds and wrinkles. Another peculiarity was the fact that the olfactory bulb which the fossil presented was three times larger than what was normally expected. This suggests that the Old World monkey had a more developed sense of smell than modern monkeys of today. Monkeys as we know them today, on the contrary, have a small olfactory bulb and a larger brain. Scientists theorize that this was a result of the fact that in time the monkey’s sight improved whereas its sense of smell worsened. Gonzales also explained that the research team used Micro-CT scan in order to establish the size of the brain compared to the body of the monkey and discovered that its volume was 36 cubic centimeters. This study offers insight into how cognitive functions developed in the case of early primates and also offers new information about how complex the monkey brain was in relation to size. So far very little was known about the Old World monkey because the number of fossils is very small. Migaloo is an albino whale. The name of the white humpback is the aboriginal for “white fella”. Migaloo, the most well-known whale of Australia has showed up again in an unexpected place. The white humpback whale is usually found along the eastern Australian coastline, but scientists in New Zealand have reported seeing the whale in Cook Strait, which separates the South and North Islands of New Zealand. The whale is seen so seldom that it is almost mythical. Migaloo was spotted on Sunday together with another black humpback whale. The day coincided with the annual survey of cetaceans in the Cook Strait. Nadine Bott, the leader of the expedition, explained that the dorsal fin and its bumps helped the researchers recognize the whale as Migaloo. The name of the white humpback is the aboriginal for “white fella”. Bott also said that such white humpbacks are very rare with only four specimens having been reported across the world. The researchers who were dealing with the 12th annual survey used this opportunity and took the first dart biopsy of the white whale’s skin layer. The biopsy will be compared with another DNA record which was obtained from the Southern Cross University in Townsville. Australian scientists at this university obtained sloughed skin from the water behind the Migaloo in 2004 off the New South Wales. It is possible for the albino cetacean to be the father of other two albino offsprings that showed up along the eastern coast of Australia. According to Bott one of them was even called MJ, which stands for Migaloo junior. Marine biologist Carlos Olavarria was present on the boat. He said that it was a unique experience and that he had never seen anything like that before in New Zealand. Peter Harrison from the Southern Cross University explained that the Cook Strait route is well-known as a migratory path for humpbacks that swim north from the Antarctic to the East Australian stock. 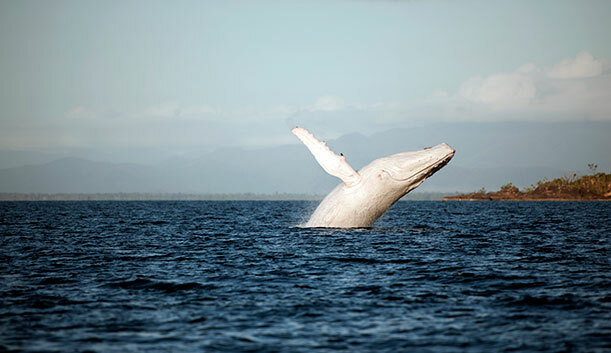 Harrison commented on the fact that the white whale was seen together with a dark-colored humpback saying that it is a known fact that Migaloo escorts females and sings to them like any other males. Previously it was believed that the whale could live around 48 years, but recent research indicates that it can ever reach 96 years. However Harrison drew attention to the fact that since Migaloo is an albino chances that it is infertile are high. And it might also have a weak immune system. The Portuguese Man o’ War with its long tentacles and brightly colored body. After they have terrorized the Jersey Shore, the infamous Portuguese Man O’ Wars have made their way to Delaware beaches. After 15 years of peace, the floating terrors return to Delaware, to the concern of beachgoers, who must be on the lookout for the Portuguese man o’ war from now on, so as to stay safe from its excruciatingly painful sting. According to the Associated Press, The Department of Natural Resources and Environmental Control has reported that Portuguese man o’ wars have been identified on Fenwick Island State Park, Delaware Seashore State Park and Cape Henlopen State Park. They are presumed to have washed up on the Delaware beaches during the weekend. These creatures are called the floating terrors, because they float on the water and only their body remains visible. They have very attractive coloring on their transparent bodies, as they have layers of blue and purple that serve them many purposes. On one hand, the blue parts keep the camouflaged on the water and therefore they are difficult to spot. On the other hand, the beautiful purple coating makes them attractive to people, who are often tempted to touch them and get stung. In the animal world, bright colors have the exact opposite effect, as they form a shield that is meant to keep predators and competitors away. The scary part is that the tentacles of the Portuguese man o’ war lie under water and are not visible when it floats. Its tentacles can grow to be up to 50 feet long, making them an actual weapon. The floating terror will use its tentacles to sting in the event that it feels threatened by a person’s presence. Therefore, beachgoers are asked to be on the lookout for this silent danger, as remaining close to it will scare it and determine it to sting. Also, it is very important that beachgoers stay away from the man o’ wars, even if they find them stranded on the beach, where they appear to be dead. This is a very dangerous moment, that could lead those who are curious enough to touch it straight to the hospital. The sting of the Portuguese man o’ war is said to be horrifically painful, but the people who get stung need to find it in them to remove the tentacles of the beast from their skin, in order to stop it from transmitting venom. While man o’ war stings are not lethal, they could cause a great deal of trouble to victims, therefore it is the wisest choice to go to a hospital, in order to get help from a specialist. In order to save polar bears on the long run the rate of climate change should be reduced. All countries in the world should make efforts to prevent the water of the Arctic from getting warmer. According to a report which was filed on Thursday by the US Fish and Wildlife Service polar bears might go extinct within ten years if people don’t do anything about the devastating effects of the global warming. The report says that attempts to protect the polar bears from the increasingly warming ocean and the scarce food resources are methods which only function for a short period of time. In order to save these animals on the long run the rate of climate change should be reduced. Jennifer Kohout, the one of the leaders of the polar bear recovery team at the US Fish and Wildlife Service said that in order to prevent the water of the Arctic from getting warmer all countries in the world should make efforts. One of the main causes which contribute to the warming of the Arctic is the greenhouse gases. That is why Secretary of State John Kerry has warned that all nations should noticeably reduce the emission of gas emissions especially the emissions of methane and black carbon. The first model presented in the report indicates that if the sea ice loss and the reduction of the food stock continue at this pace polar bears might go extinct by 2025. The second scenario is the one in which gas emissions will be reduced. But irrespective of the scenario the conclusion is the same: some polar bear populations will sooner or later be affected or even go extinct. The US Fish and Wildlife Service also proposes a plan to save the polar bears. According to Jennifer Kohout the main goal is to abate global warming. The plan also targets a better management of the food resources, measures to keep the animals safe from oil spills and a better way to decrease the number of conflicts between humans and bears.